This might not sounds like a lot of time in which to prepare a meal from scratch but 20 minutes does actually give you a decent number of options when it comes to homemade meals. It’s true you won’t be able to rustle up a roast dinner but if you’re just looking for quick ideas after a hard day’s studying then it’s perfectly possible to get your taste buds going in under half an hour. We’ve put together a few ideas to get you going and as long as you’re organised and know where your utensils and ingredients are, then you won’t run over the deadline and you can make the beginning of your favourite programme on the telly! Take the required amount of cooked, frozen prawns from the freezer, place in a colander and run under the tap until they have defrosted. Place the spaghetti in a large pan of boiling water and cook. Meanwhile, fry 1 chopped shallot (or ½ a small onion) in a pan in a little olive oil. Add 1 chopped garlic clove and fry for another minute. Stir in about 50ml double cream and heat through then add the prawns and stir well. Drain the spaghetti and toss with the sauce. Serve with a green salad. Place the couscous in a bowl, add a knob of butter and cover with boiling water from the kettle. Cover the bowl with a plate and set aside for 15 minutes to steam. Meanwhile place a white fish fillet on the grill pan, drizzle with olive oil and cook according to the pack instructions. While the fish is cooking, chop a handful of fresh parsley and mix together 1 teaspoon of green pesto with 2 teaspoons of crème fraiche. Fork through the couscous and stir in the parsley. Serve with the fish and the pesto sauce. Break two eggs into a bowl, add a good dash of milk and whisk until combined. Heat a little olive oil in a small frying pan and add ½ chopped onion, ½ diced green pepper and ½ diced courgette. Cook for about 5 minutes until the vegetables are softened then pour in the egg. Cook until the underside is getting a little colour then sprinkle over a handful of grated cheddar and fold the omelette in half. Cook for another minute or so then serve. Cut a chicken breast into thin strips and place in a bowl with ½ teaspoon turmeric, the juice of ½ lime, a pinch of chilli flakes and some salt and freshly ground black pepper. Stir well to coat the chicken. Preheat the grill to medium. Heat a little olive oil in a small frying pan and fry the chicken over a moderate heat until cooked through. Meanwhile, combine 1 tablespoon natural yoghurt with 1 tablespoon diced cucumber and 1 tablespoon freshly chopped mint. 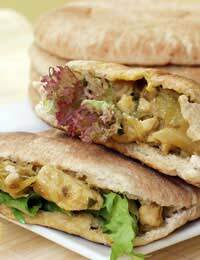 Place a pitta bread under the grill under warmed through then carefully split it. Fill with the chicken and spread the yoghurt dressing over the top. Serve with salad. All these meal ideas can be prepared in 20 minutes or less so there’s no need to resort to beans on toast if you don’t have much time to cook!